The Perfect Gift! The Tarascon Pocket Pharmacopoeia® has been the most popular and most trusted source of portable drug information since 1987. This CD guides you to download our acclaimed reference to your Palm®, Pocket PC®, or Blackberry®. It will also allow you to “charge up” your current account with more months of uninterrupted drug prescribing information. 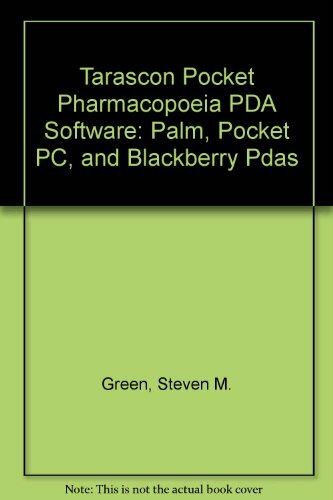 The Tarascon Pocket Pharmacopoeia® PDA edition includes: Expanded drug information from the Deluxe Edition of the print Pocket Pharmacopoeia A fully integrated tool for multiple drug interaction checking Continuous ongoing drug information auto-updates via the internet Palm®, Pocket PC®, and Blackberry®, versions, including support for most extended memory cards A fully integrated Herbal & Alternative Therapy section 47 invaluable reference tables and 9 dynamic medical formula calculators Both convenient relative pricing codes ($ to $$$$$) and exact prices directly from www.drugstore.com Extensive pediatric drug dosing Unique Canadian trade names and drugs Software written by USBMIS, Inc, creators of the popular PDA versions of The Sanford Guide® As with all Tarascon editions, our drug information is meticulously peer-reviewed by drug information experts and practicing clinicians of multiple specialties. We include typical drug dosing (both FDA approved and off-label uses), available trade and generic formulations, metabolism, and safety in pregnancy and lactation. If you have any questions about this product by Tarascon, contact us by completing and submitting the form below. If you are looking for a specif part number, please include it with your message. Yao and Artusio's Anesthesiology, Fifth Edition, for PDA: Powered by Skyscape, Inc.
Signs & Symptoms for PDA, CD-ROM Version: Powered by Skyscape, Inc.